NETWORK FINALS: THE KIDS ARE ALRIGHT, ROSWELL NEW MEXICO and the rerun of THE MASKED SINGER all lost 0.1 in final numbers. CABLE HIGHLIGHTS: Tuesday cable was dominated by the STATE OF THE UNION and related programming, and the ratings reflected the ideology of the networks: Fox News led at 1.50, with CNN at 0.80 and MSNBC at 0.49 (on the latter, the DEMOCRATIC RESPONSE and the network’s post-speech analysis had higher ratings than the speech itself). History’s CURSE OF OAK ISLAND dropped 0.07 to 0.70, and PROJECT BLUE BOOK fell 0.06 to 0.25. 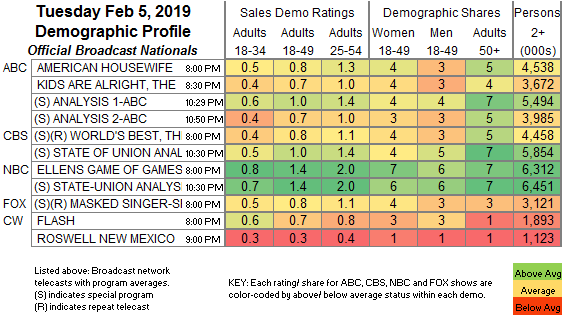 On USA, WWE SMACKDOWN lost 0.06 to 0.64, and TEMPTATION ISLAND ticked down to 0.30. Bravo’s BELOW DECK shrank by 0.12 to 0.51. On ID, BODY CAM gained 0.06 to 0.36, and AMERICAN NIGHTMARE was down a tick to 0.24. On Lifetime, MARRIED AT FIRST SIGHT was steady at 0.35, and MY BIG LIVE WEDDING premiered at 0.12. On TLC, I AM JAZZ ticked down to 0.34, and MY BIG FAT FABULOUS LIFE was down 0.02 to 0.27, with a KATE VS MEGHAN special at 0.15. Food Network’s CHOPPED held at 0.34. OWN’s THE HAVES AND HAVE NOTS slipped 0.03 to 0.34. 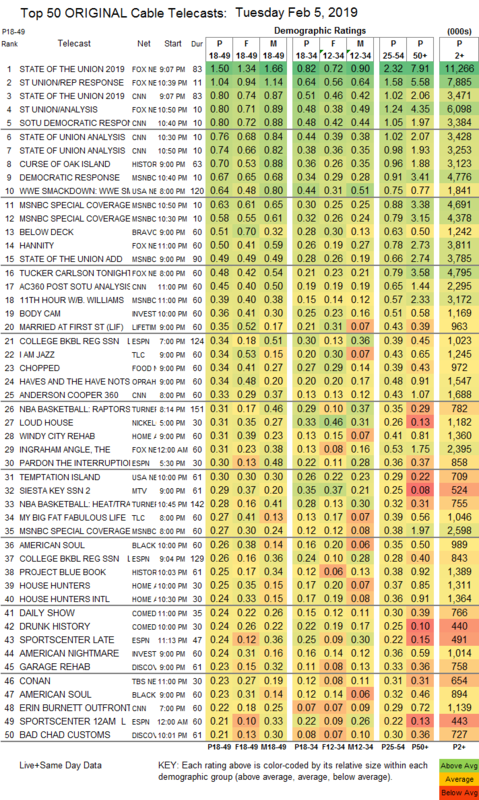 On HGTV, WINDY CITY REHAB ticked up to 0.31, HOUSE HUNTERS gained 0.02 to 0.25, and HOUSE HUNTERS INTL ticked up to 0.24. MTV’s SIESTA KEY fell 0.09 to 0.29. BET’s AMERICAN SOUL was at 0.26/0.23. On Comedy Central, DRUNK HISTORY rose 0.03 to 0.24, and CORPORATE was down 0.06 to 0.11. Discovery, GARAGE REHAB dropped 0.08 to 0.23, and BAD CHAD CUSTOMS was down 0.05 to 0.21. A&E’s SCIENTOLOGY & BEYOND THE AFTERMATH fell 0.09 to 0.21, and MANY SIDES OF JANE was down 0.06 to 0.07. Freeform’s just-renewed GOOD TROUBLE climbed 0.03 to 0.15. TV Land’s TEACHERS fell off the chart, down 0.05 to 0.05/289K.